Statistics show that one out of ten Americans has some form of hearing loss. Though aging is the most common reason people lose their hearing, a growing number of young Americans are experiencing hearing problems due to exposure to loud noises. To monitor and prevent hearing loss, audiologists recommend that people—especially those over 50 and those at risk for noise-induced hearing loss—have their hearing checked annually. A brief test of pure tones (beeps) presented at different pitches and loudness levels to determine if there is a potential hearing loss. An automatic test that indicates if a possible problem exists within the middle ear system; i.e., ear infections or fluid behind the ear drum. A comprehensive hearing test that obtains pure tone air and bone conduction thresholds, speech reception thresholds, and speech discrimination ability scores. Clients evaluate several different hearing aids to determine which model provides the most appropriate sound quality and clarity. All makes and models of hearing aids are available at affordable price levels to accommodate a person’s financial situation. In addition, hearing aid repair services, ear molds, swim plugs, hearing protection and hearing aid accessories are available. 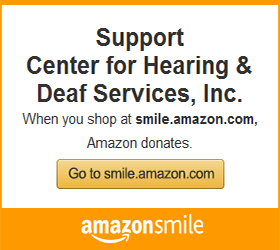 HDS offers a variety of hearing aid options. The agency is one of the few suppliers of reconditioned and recycled hearing aids in the Pittsburgh area. All new hearing analog aids have a two-year warranty and include accessories. Styles include: in-the-ear, behind-the-ear, in-the-canal, body, eyeglass, cros/bicros and completely-in-the-canal. New digital hearing aids have a 3 year warranty. Behind-the-ear hearing analog aids have been factory overhauled and have a one year repair warranty. Custom earmold is included. Donated behind-the-ear analog hearing aids that are in proper working order are dispensed for a small fee without any warranty, when available. Pennsylvania and federal regulations require that prior to the sale of a hearing aid, a dispenser must obtain either a medical recommendation signed by a physician or a signed waiver if the user is 21 years of age or older. Individuals have the option to return their hearing aid(s) to HDS within 30 days of the fitting date provided the instrument is returned in good condition. Monies paid towards the hearing aid will be refunded, except for any testing costs, the price of any earmolds and a $50 trial fee. Half of the total cost of the hearing aid is to be paid on the date of service. The balance may be paid in monthly installments for six (6) months. Acceptable payments are cash, check, money order, VISA, Mastercard, Discover, and American Express. A fee schedule is available upon request.